Nostalgia: Ed Hood has been in the bike shed again and pulled out more old cycling gear ideas to tease that fine line between the weird, the wonderful and the 'what where they thinking?' Some bits of retro equipment have become iconic, while others are just plain goofy - and most went in the trash can. Nostalgia or junk? You decide. Mavic Zap - Was it so bad? We’ve debunked the ‘retro myth’ but there’s much to be said on the subject of equipment from the recent past which ‘shoulda/coulda/woulda’ - but never quite cut it. 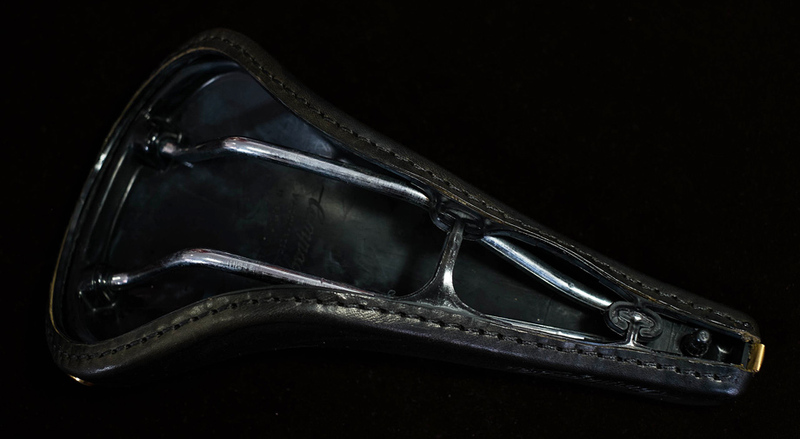 . .
Let’s start where man meets bicycle – the saddle. These passed me by somehow but I heard about them last year and did my due diligence. The next point of contact – the ‘bars. After Greg Lemond famously used ‘tri-bars’ to beat Laurent Fignon in the final time trial of the 1989 Tour de France by a significant enough margin to win the race overall by eight seconds the world went 'handlebar crazy'. Scott ‘Drop Ins’ had an additional section of tubing which did a 90 degree turn inwards where your normal ‘bars would stop, to give you a very ‘aero’ hand position. Despite the fact that they had to be constructed with heavier than normal tubing because of the extra leverage involved they had a reputation as not being rigid enough – ‘noodly’ one user described them as. They never caught on but can still be seen in old pictures of Greg in ‘89/’90. 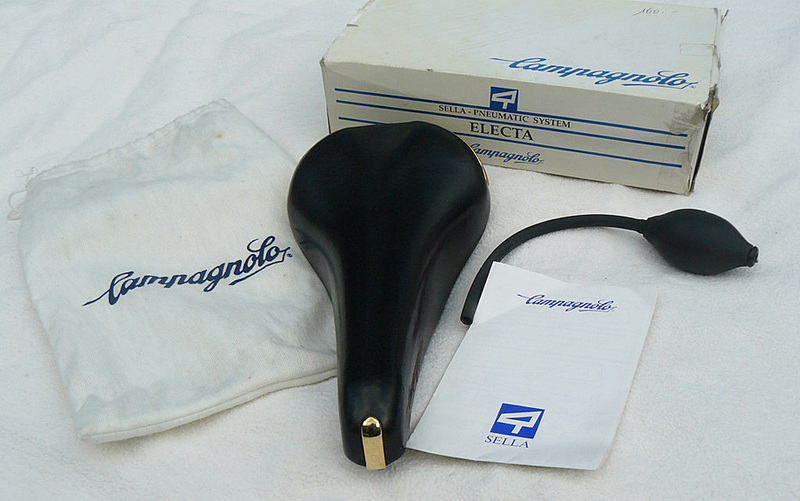 In the days of ‘quill’ stems, the Italian company Cinelli were always at the forefront; their 1A extension was a thing of smooth beauty, as was the ‘Record’ stem albeit didn’t grip your bars as well as the previous 1A did. 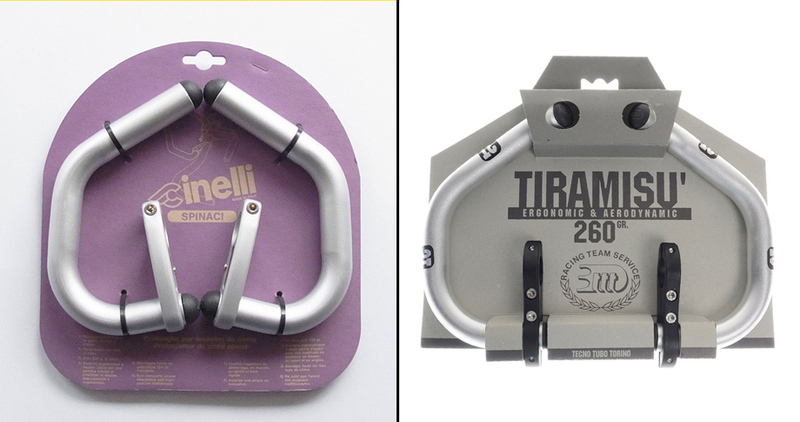 The Spinaci – and rival company 3TTT’s ‘Tiramisu’ - bars were a hybrid which clamped on to your existing bars to give additional more stretched out and therefore aero positions. Unfortunately the UCI took an ill will to them on the grounds that they were dangerous; so the riders took to hanging on to their STi cables – even more dangerous. 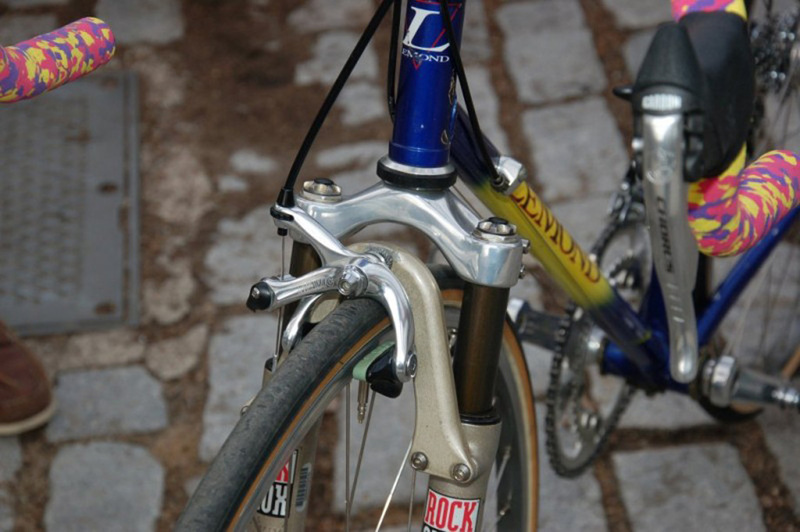 But the purists among us were glad to see them go – scaffolding clamps don’t belong on pure race bike handlebars. All have their adherents but how come none of them REALLY caught on? With the M71’s it’s perhaps understandable, they were way ahead of their time. 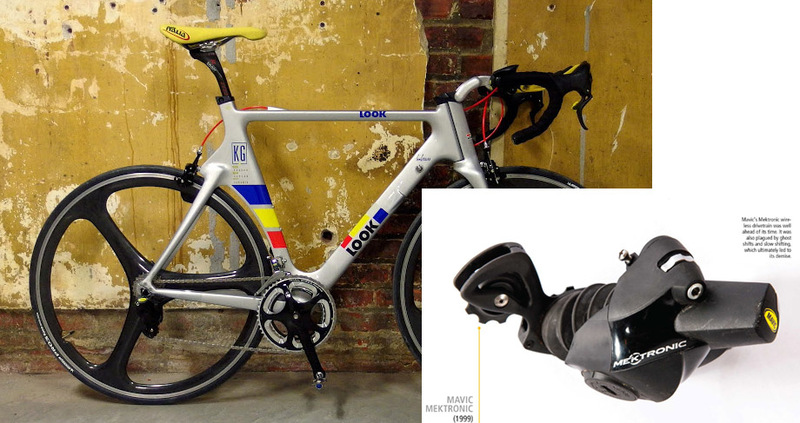 And Adidas’s little lever on the pedal was never going to cut it when all you did with Look was step in. M71 apart, everyone was playing 'catch-up' with LOOK and TIME, the company which LOOK inventor Jean Beyl formed when he split with LOOK. At time he took the concept further at TIME, giving ‘float’ to the system. 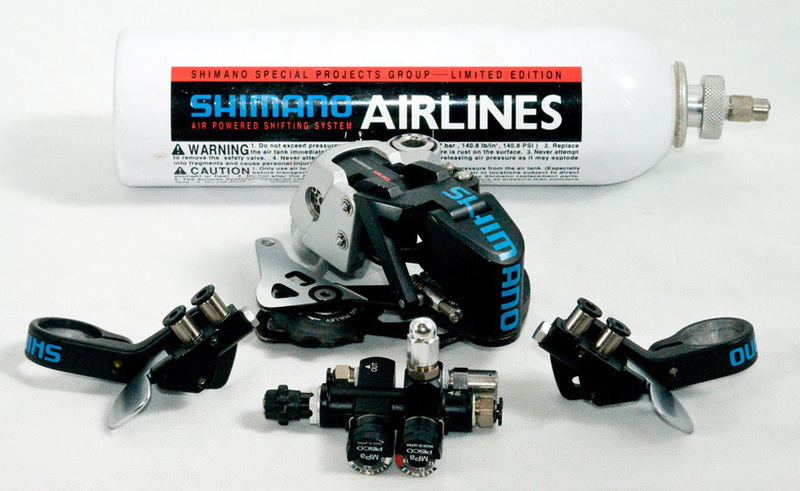 Shimano did the usual Japanese thing of sitting back seeing what everyone else does - then doing it better. Today, Look, Time, Shimano and Speedplay’s tiny offerings with their excellent cornering clearance dominate the market. 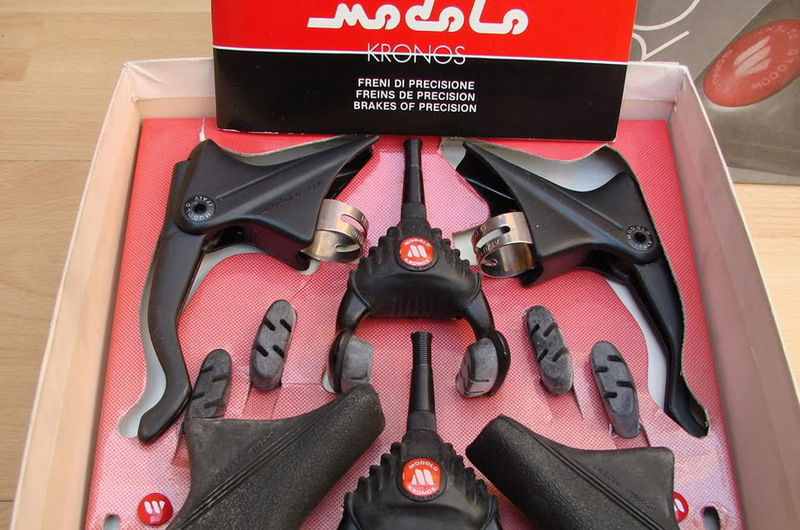 But check eBay if you really fancy a set of Merckx Podios, you can buy a new set there, complete with shoes for 170 bucks. Let’s get on to stopping - this one will split you down the middle. Aesthetically they were a challenge, on the bike of a big guy like Guido Bontempi they looked cool; but stick them on a tiny Spanish climber’s bike and they looked massively disproportionate. Engineering-wise they were gems with the inner workings of a Swiss watch but they were very fiddly to adjust and not at all popular with the pro mechanics. And they weren’t the best at stopping you with those tiny brake pads – little wonder they flashed across the pro peloton like a comet and then were gone. However, whole magazine articles are still devoted to them and they fetch big bucks on eBay – nostalgia is a wonderful thing. 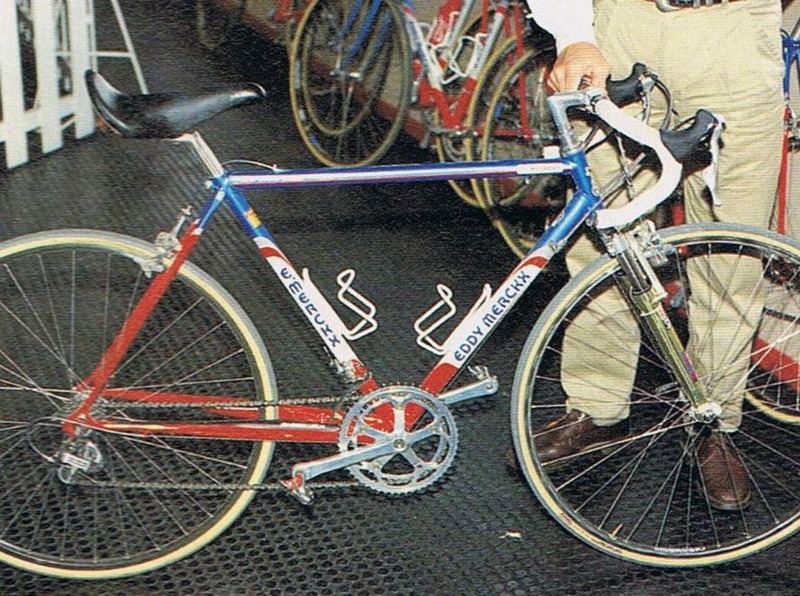 Our PEZ editor, Alastair Hamilton, was the Raleigh-Banana team mechanic in the late 80s and had first hand experience of the Delta Brakes. "They were beautifully made, mechanical perfection, but they just didn't stop the bikes. I tried different cables and blocks, but in the end it came down to them being set-up properly and clean, so they were degreased and re-oiled every day." Cool in matt black, tiny, aero and looked great on your time trial bike. What’s that? They didn’t work and were deadly in the rain? Let’s not split hairs, guys. With only 2,000 sets ever made these are rare birds and the internet is awash with Kronos chat. Damn! I wish I hadn’t sold mine. . . I have a confession on these – I almost bought a set. Thank God I didn’t, Dave still gives abuse about my pink Moulton from 1976, if he’d seen these things on my bike I’d have had to go into a monastery. Despite letters in the cycling mags from engineers frothing at the mouth that it was a gimmick and did NOTHING to enhance your pedal stroke, power or anything else, they sold them and there are plenty of images of British time testers using the beasts back in the 80’s – perhaps the fact that Time Trial King, Ian Cammish had them on his bike had a lot to do with that. Next time we speak to Ian we’ll have to ask if he actually paid for them though? Did they make any difference to British TT specialist Ian Cammish? This one spans the years, debate has raged about them since I started cycling but Froomey and Wiggo’s recent favoring of them has brought them back into the limelight. The principle is that the shape of the rings means that the gear is highest where you can apply the most pressure and lowest near to ‘top dead centre.’ Here’s the ‘but’; ‘would you ever see them on Pippo’s bike?’ No danger. 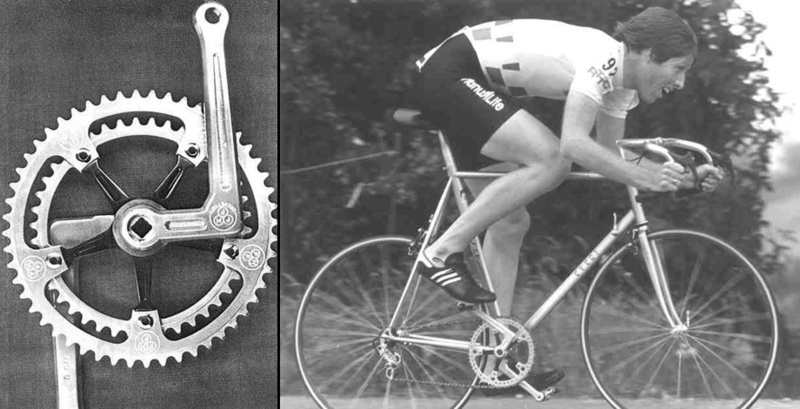 It was in 1992 that Mavic launched a gear changing system which should have taken the world by storm – electronic. 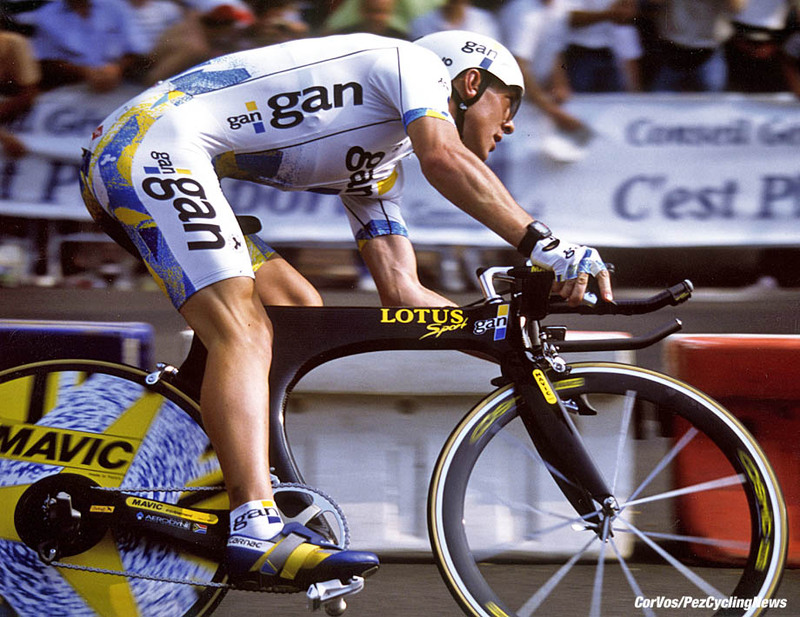 Much less complicated than any of the current - due to its solenoid operating system - Shimano/Campagnolo/SRAM offerings Chris Boardman rode it to victory in Tour de France prologues and most of his half a century of time trial and prologue wins. 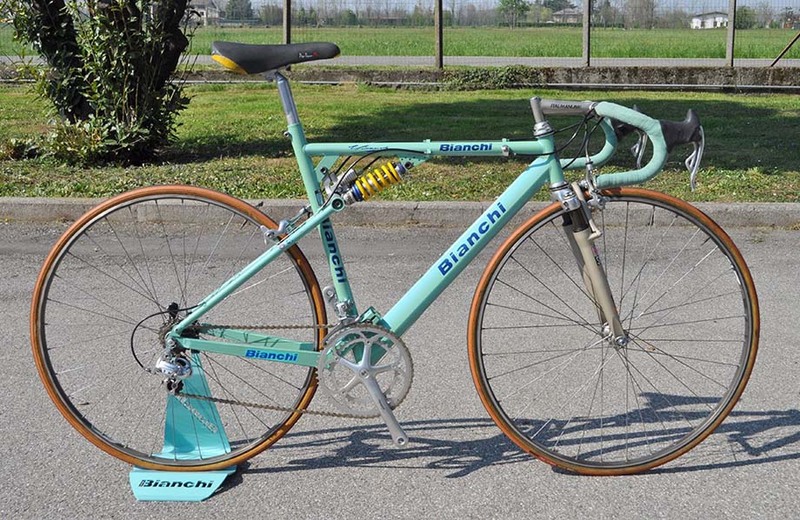 With it being possible to locate the shift buttons anywhere on the ‘bars it meant Boardman never had to leave his aero tuck. However, the sight of Alex Zulle’s TT bike changing gears by itself in a crucial Vuelta time test, unprompted by the rider did its rep no favors. 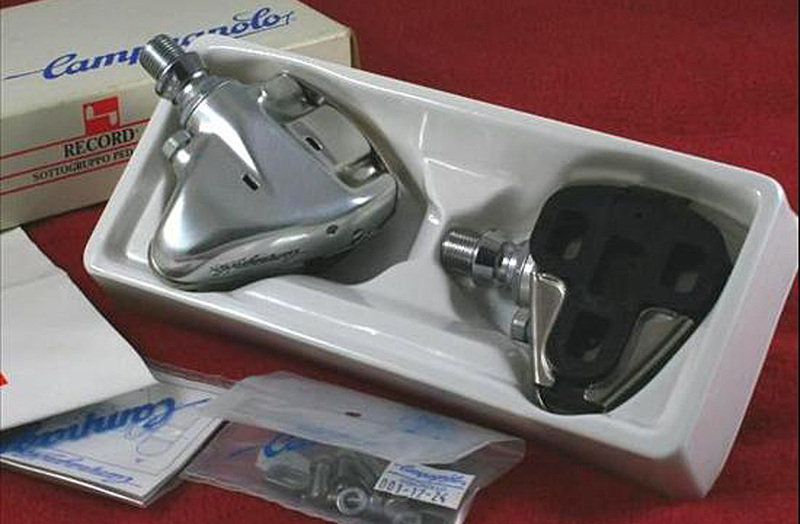 The even cooler – and wireless - ‘Mektronic’ system came later with it’s fabulously OTT brake levers but somehow it was two decades later before gear cables were finally usurped. 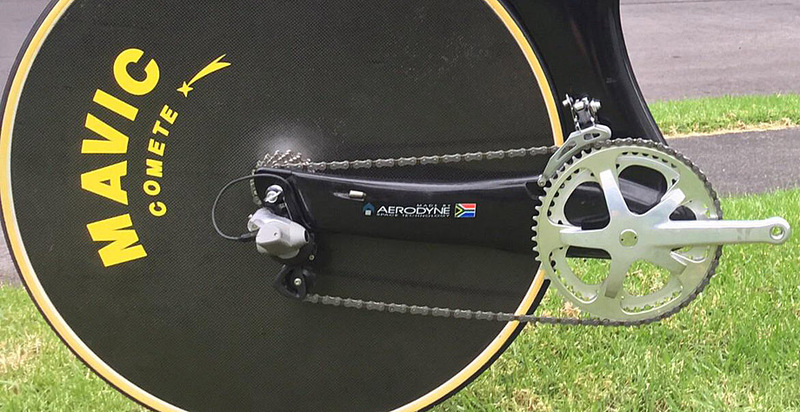 Mavic went electric but Shimano went compressed air to shift the chain across those cogs; designed for the downhill MTB scene there’s no doubt that the Japanese would have transferred the technology across to the road had it proved successful – but thankfully it didn’t. Would you want a compressed air reservoir on your bike? Me neither. But there’s bound to be one in the Shimano museum? This was actually a very neat piece of kit and wasn’t expensive; a radiused retainer for the chain attached to the fork end. The gear lever had an extra position so as you could ‘over-shift’ the chain off the freewheel onto the radiused retainer – no more chains flapping about whilst awaiting a rear wheel change or transporting the bike. The problem was that it took up the space of one sprocket – and we all wanted more gears, not one less. 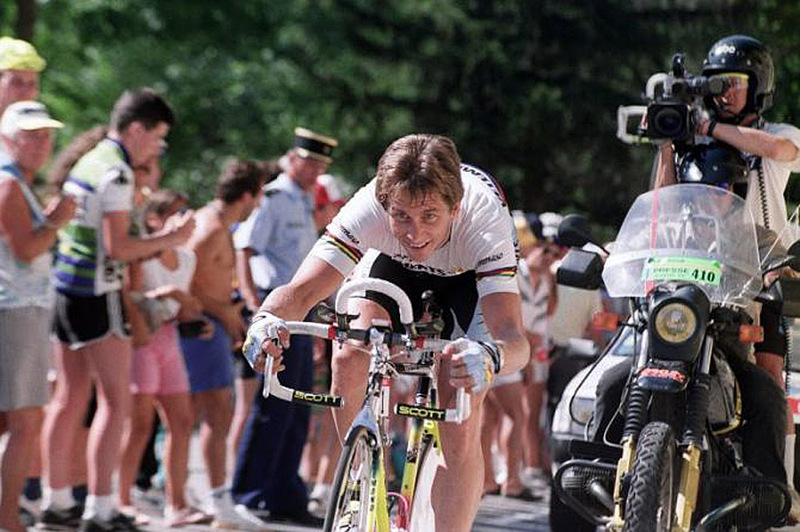 Carbon pioneer, Craig Calfee – he’s the man who supplied Greg Lemond’s carbon Z team bikes – says that one day all race bikes will have suspension. The right suspension set up greatly improves traction in ‘on the edge’ situations, he says. I’m not gonna argue with the man. 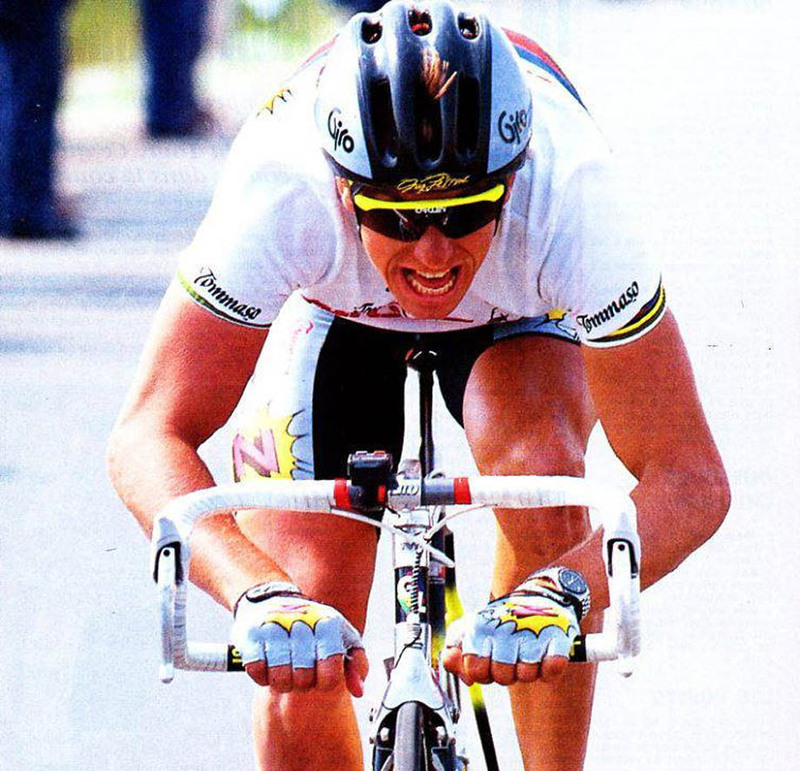 And for a few fleeting years in the early 90’s it looked like he was going to be proved right with French hard man Gilbert Duclos-Lassalle winning Paris-Roubaix in the ’92 and ’93 then beyond-hard Russian/Moldavian/Belgian, Andre Tchmil taking the cobbled win in ’94. But then along came Team Mapei, winning five of the next six editions of the race - their bike builder, Ernesto Colnago would rather stick pins in his eyes than defile one of his creations with THOSE! But Craig Calfee said 30 years ago that everyone would be riding carbon frames one day - and they laughed at him. . .
Light, cheap and didn’t look too bad – how could you go wrong with one? 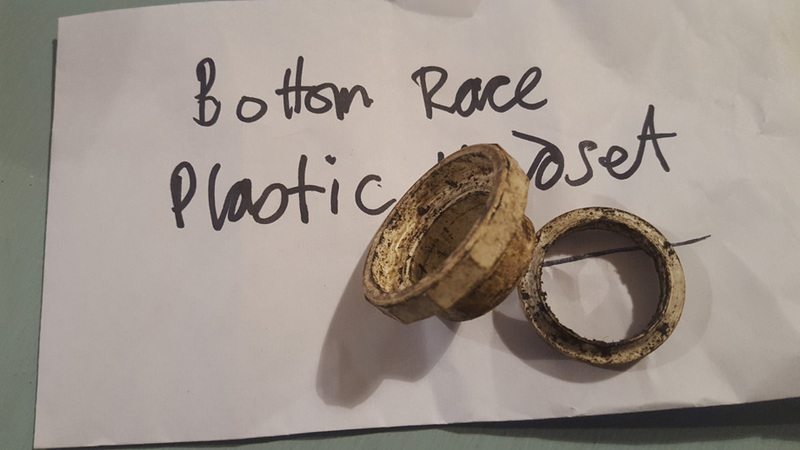 Well, because the bearing surfaces were nylon (that’s plastic) and the ball races were steel the bearing surfaces soon took on indentations from the balls – cue that day when you try to turn a corner but the headset won’t play ball. I have experienced this phenomena at first hand. . . Vik had the bottom races of one in his junk box and very kindly posted them through my letterbox so I could photograph them for this piece. Eye catching, light, strong the Kirk Precision seemed to have it all. 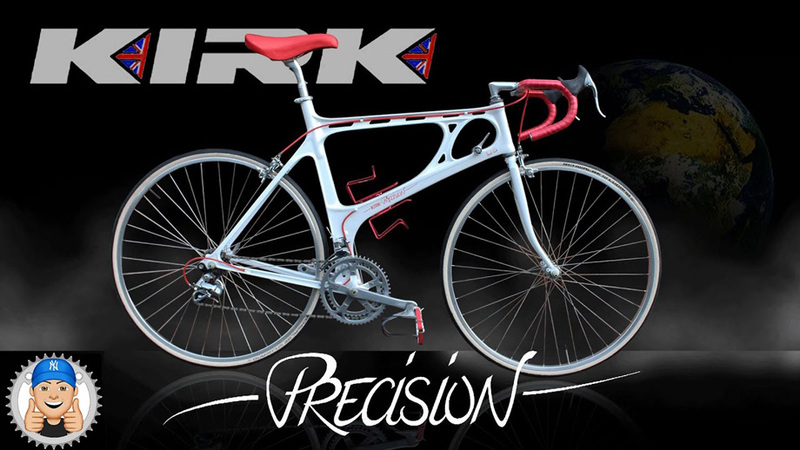 Frank Kirk was a gifted aeronautical engineer who decided he could use ‘wonder metal’ magnesium to manufacture bike frames. Note that I did not say ‘build.’ Kirks were built by pumping molten magnesium into a mould at huge pressure. The downsides were that the steel inserts to take the seat pillar, bottom bracket and headset tended to loosen off, magnesium corrodes easily if exposed to air so scratches to the bare metal could be fatal and magnesium is highly flammable. Is that all? And they did bear a striking resemblance to a portable ‘do it yourself’ work bench of the time called a ‘Black & Decker Workmate,’ not cool. Ernesto and Pippo would shake their heads. . . .